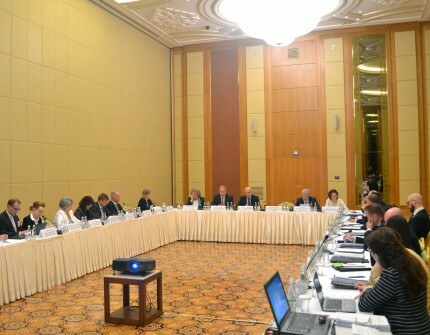 On April 15, 2019, the Regional Meeting of the Heads of the Central Asian Missions of the Organization for Security and Cooperation in Europe was opened at the Yildyz Hotel in Ashgabat. The meeting was attended by representatives of the OSCE Secretariat, representatives of the OSCE program offices in Central Asia, representatives of the OSCE Parliamentary Assembly, OSCE coordinators, heads of the EU delegations in Central Asia, leaders and leading experts of relevant departments of the country, as well as media representatives. Participants noted the high level of the current event organized by the Government of Turkmenistan and the Organization for Security and Cooperation in Europe. The great importance of the current meeting in strengthening the dialogue and productive contacts between the participating States on the most pressing issues of our time was emphasized. In this context, it was emphasized that in modern conditions the states of Central Asia play a prominent role in addressing topical issues related to strengthening international security. The guests noted that Turkmenistan, being an active participating State of the OSCE, continues fruitful cooperation with the Organization in strengthening security in the OSCE region. The participants also noted the long way of the OSCE and Turkmenistan, priorities of cooperation between Turkmenistan and the OSCE. Tomorrow the regional meeting will continue its work.